FM Einheit contributed to invent the very same notion of industrial music, starting from his crucial role in Einsturzende Neubauten up till now, always moving towards directions unknown, following unpredictable paths; Massimo Pupillo has moulded a basic, brutally impressive and basically one-of-a-kind sounding out of the four strings of his indestructible electric bass. 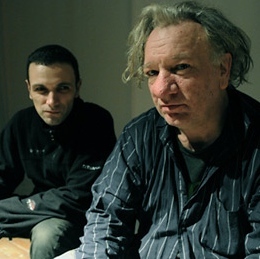 Together them two have generated EVOL/VE, one radical improvisational project that brings industrial music itself to the next level. Obtained mostly out of raw live sessions, later remixed and reprocessed, the eponymous album for Offset Records, is in fact a measure of capacity of these two individuals captured in a state of grace. By the way, you have to see them perform live to get the whole experience. In times when almost every possible continuum has been torn down by new technologies and many of the prophecies once told by unhopeful cyberpunk novelists have come true, after having witnessed the substantial moldering of music itself into billions of cold files to be stored into hard-disks that could crash anytime, the moment has come to raise the tools of the trade again, to start making new noise, with new means and new motivations. New buildings keep on collapsing. Fm Einheit – the interview – 2010 – indie-eye network from indie eye on Vimeo.